We are one of the main manufacturer and exporters of a trendy accumulation of designer Platters. Offered Platters are remarkably conventional with the ancient designs, these products are extremely appreciated by our clients for their elegant look and strong nature. We have been offering our clients a qualitative range of Stainless Steel Serving Platters. SS Platter makes meals at home and on the go easy and fun even for the picky eaters. It is sure to outlast any other; it will not stain, harbor orders, rust or crack. Running with an objective to meet the need of our important clients, we are committed towards offering defect free Compote Dish. 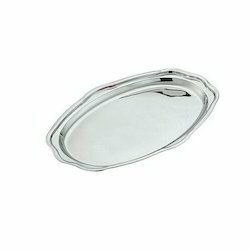 Serve your food in style on this finest quality stainless steel round-serving platter, which is available in different sizes. 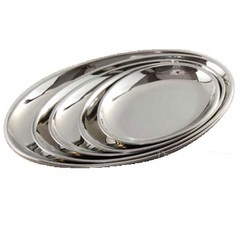 Serving plate features mirror finish and is easy to clean. Our company is a leader in manufacturing and supplying stainless steel serving platters. We are widely acclaimed as one of the prominent manufacturers and suppliers of stainless steel dish serving platters & trays in Chennai. Note: We also manufacture Oval Plates according to customer requirements. We offer this product in different specification and price . The price indicated on this product is for the minimum size available . Prices may vary for higher specifications . We offer best prices for bulk orders .